Time for a confession- I spend so long doing marketing for other people that I forget to do marketing for myself. Whether that’s promoting the agency I work for, or my own personal brand building, the fact is if you’re marketing 9 to 5 for other people by the time it comes to your own stuff you can be pretty sick of it. 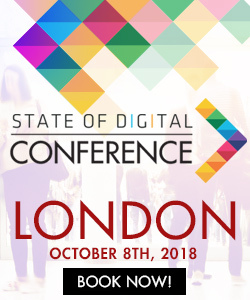 A couple of week’s ago, there was a great post on State of Digital from Steve Morgan that explained a fatal error of marketing to our friends and peers instead of the right target groups. But what happens if the right target group is our peers? As an agency if you’re selling your services the likelihood is that will be to other marketers, be they an in-house marketing manager or a business owner or even another agency. These are people that have an awareness of the marketing industry as a whole, know the tactics and are looking to be impressed. It goes without saying that this is an extremely difficult audience to crack. On the quest to work out the best way to market a digital marketing agency, I’ve been looking at what others in the industry are doing and worked out some common themes in things that are working, and things that are not. 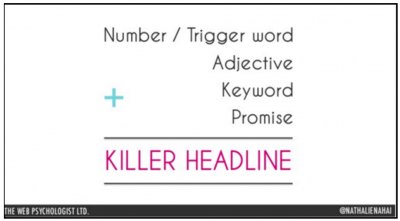 Understand what your audience is doing at the time, and write a headline accordingly. But to those of us who write headlines day in, day out – would this method still have an impact upon us? Despite the fact some of us think we have superhero powers, the core here is that even digital marketers are humans so the typical way of constructing your messaging should still be as effective. However, the cynicism comes from when we know we’re being marketed too. The headline above is killer, only if we don’t deconstruct it. The second our brains begin to segment the statement into the elements in the above equation it becomes ineffective in getting our buy-in. The way to do this is to implement these headline tactics when the marketers will be relaxed and their business brains dialled down (read: evenings and weekends) and then to really strip this back when they’re going to be most active (working hours). In working hours keep your messaging simple, remember that if you engage in one of these tactics then make sure your content backs it up so it cannot be branded as click bait. If you’re unsure or you’re spending time struggling to come up with that attention-grabbing headline then you need to say-what-you-see and ensure you’re clear in your wording. Sometimes the best way to sell is proving that you are the best at what you do. For a typical e-commerce business, it can be difficult to demonstrate that you are the best at what you do. Whilst you can collate reviews and other trust signals, gaining empirical evidence that your product or service is the best can be a challenge. Marketing is a special case here. As a marketing agency, you can demonstrate how skilled you are in your field by doing your own marketing well. It’s difficult to argue that someone who’s paid advertising campaign drew you in wouldn’t be able to replicate the same success for your business. 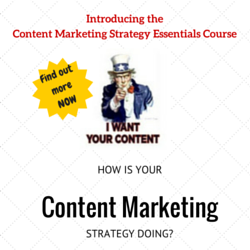 There are many different ways to demonstrate your skill level across the marketing sector. Whether that’s through producing thought leadership content, research pieces, strong SEO performance or an outstanding paid media campaign. The agency I work at, White.net, is passionate about keeping its blog up to date with informative and useful articles on all things digital. Our guidelines for writers state we need to add value to those reading the blog and see it as a source of knowledge, rather than a sales tool. In doing this, the blog has become the first point of entry for many big brands into knowing who our agency is. This content is the core of what we do, not only does it demonstrate an understanding of the industry as a whole but it also proves we can write and produce high-quality content too. The agency I work at, White.net, is passionate about keeping its blog up to date with informative and useful articles on all things digital. Our guidelines for writers state we need to add value to those reading the blog and see it as a source of knowledge, rather than a sales tool. In doing this, the blog has become the first point of entry for many big brands into knowing who our agency is. This content is the core of what we do, not only does it demonstrate an understanding of the industry as a whole but it also proves we can write and produce high-quality content too. Now imagine approaching a marketing manager of a big brand and being able to explain that for a localised search of your key service (in such a competitive market) your website ranks that highly. It immediately supports your claims of being highly skilled in your sector and will impress even the most cynical of marketers. A ‘like’ and you’d see a series of positive adverts telling you just how great you are, meanwhile, a ‘dislike’ and the ads became infinitely more annoying with bright colours telling you to click. 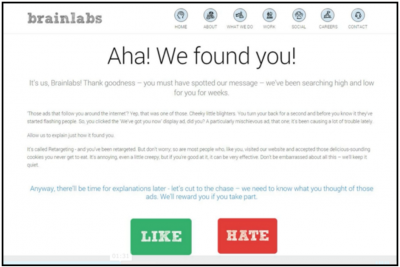 Here this took you to an explanation of the whole campaign and how users were grouped into these audiences and marketed to accordingly. If you can’t think of anything clever to say, then just make your point and stop. In an overly competitive marketing when consumers are busy, it’s important to capture your audience’s attention in a unique way. Innovative ideas can be key to successful marketing and stand out from the competition. Just remember this audience group of marketers can be harder to impress than most. They spend all day thinking of campaign ideas and marketing techniques so even your smartest idea may seem outdated to them. Unless it’s pure genius, remember your audience are busy so just keep it simple so they understand your message. If you’re choosing to do paid social media advertising then remember why this particular audience is using this channel. If I’m browsing through twitter during the day, the likelihood is I’m looking for interesting articles on Digital Marketing or at the way particular brands are handling an event or trending topic. This means quick scrolling and looking for things that really stand out, the worst thing a brand can do with an advert here is waste my time with something overly complex or trivial. 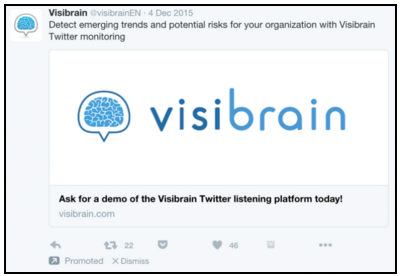 Visibrain keeps it simple with its twitter advertising and simply states what the tool can do, offers a click for a demo and had a clear brand presence. 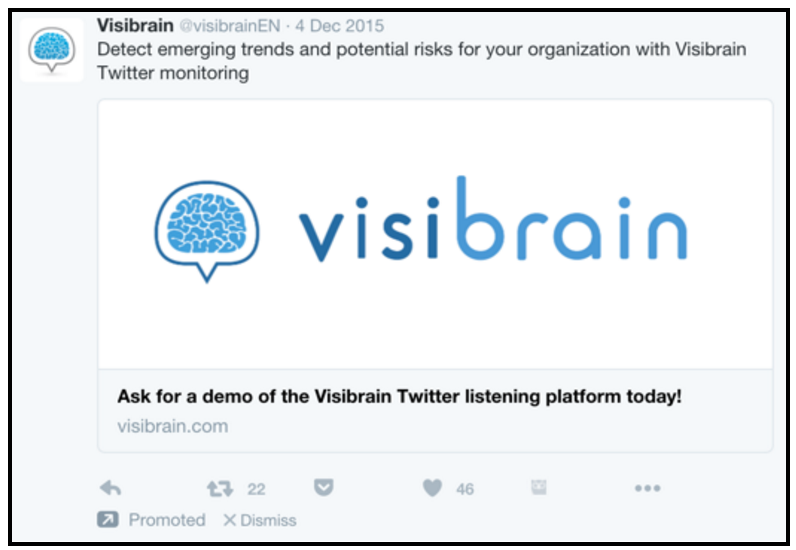 Whilst on social to complete a task it is unlikely I’d click this advert, however by utilising a large brand image in this way, when I do need a Twitter monitoring tool then I will already have brand recognition for Visibrain. There’s a 95% chance you’re not funny, remember that. Data doesn’t lie. There is nothing worse than a brand thinking it is funny when it’s not. Cringe jokes are just that, cringe. There’s not much more to say here, you probably think you’re hilarious and your colleagues who spend every day with you will be used to your jokes. Before you publish a funny piece of marketing or run a campaign based around a joke, test it with different groups of your audience (who aren’t obligated to laugh as they’re on your payroll) before you inflict it on the rest of the world. 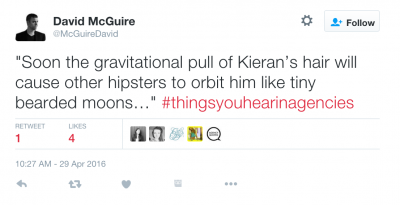 As with any audience group, making jokes and trying to use humour in your advertising is a big risk with this group. Whether it’s jokily written text on site or on your marketing materials or a tongue-in-cheek paid ad, there’s the risk that your joke is going to fall flat. The difference with marketing to your peers is that there is a much higher chance that you will have the same sense of humour, or inside jokes, as one another. That’s where the 5% in this lesson comes into play. Have you ever had a client ask you to make the colour white look whiter? Possibly not. But the likelihood is you’ve had a similar ridiculous request. If so, there’s an instant bond here over the expectation that you can achieve the unachievable with your marketing methods.Similarly,both the audience and yourselves probably have the same natural instinct to either use alliteration whenever possible or turn any statement into a pun. This is where humour can be forgiven, if you’re building a bond through a shared experience then this method can be really effective here. Look at accounts like @agencyquotes and you’ll soon realise you’re not alone. Most of the people working in-house and making buying decisions regarding digital marketing services have worked at an agency previously so there’s some common ground here. Ok, it’s obviously not as simple as that. Marketing to any audience group is tricky, but if it wasn’t then we’d all be out of a job so let’s not wish for simplicity. The core to all of the points above is making your brand stand out to the target market, whether that’s through a funny campaign or just keeping things simple. In essence, marketing to other marketers need not be seen as an impossible challenge. Even the rock stars of the digital marketing world are not immune to a well-constructed campaign so keep calm, apply your creative brains and get going. The worst thing an agency or a software can do with its own marketing is nothing. Your article has some valued information, but it also contains a trove of typographical and structure errors. I would suggest resubmitting without these issues. I.E. Special Considerations has an entire paragraph duplicated.